View More In Fryers - Page 5. 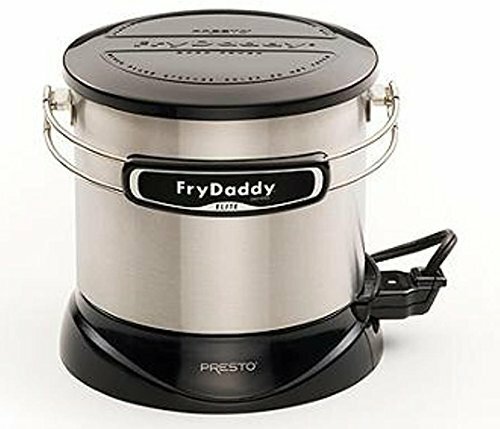 Make like a pro in the kitchen and whip up tasty, crisp meals with this Presto FryDaddy Elite 4-Cup Electric Deep Fryer. This must-have appliance is the original nonstick, electric deep fryer that has been around for over 30 years. Now, it comes in a new, updated brushed stainless steel exterior. The Presto electric deep fryer can prepare four big servings with only four cups of oil, and is designed to maintain just the right frying temperature automatically. It is also easy to clean. Make delicious French fries, battered vegetables, chicken wings and more with this 4-cup deep fryer. This model comes with a scoop to lift, drain and serve. The snap-on lid allows you to store oil without the risk of spills or odor.